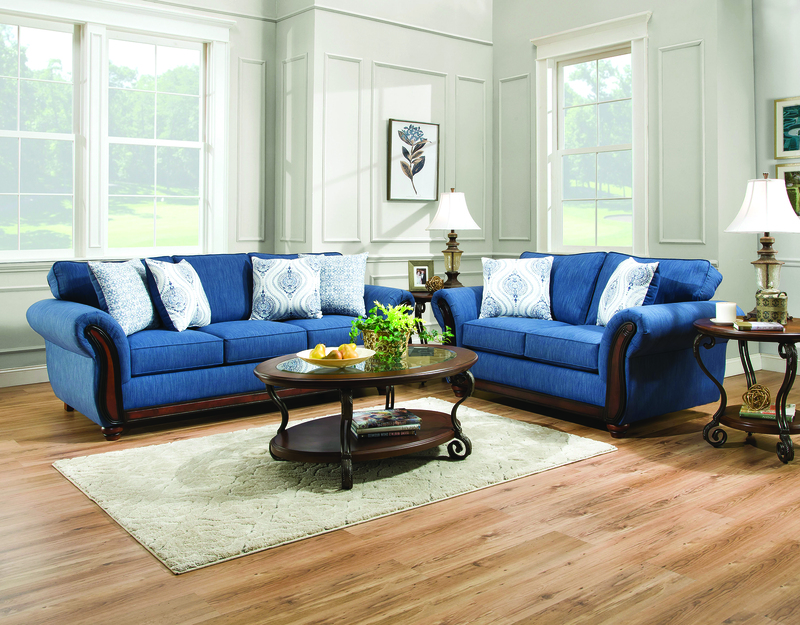 This stylish living room set comes in a bright, beautiful ocean blue shade. Named after the Pacific Ocean, this Malibu Sea blue sofa and loveseat reminds us that life’s a beach. With bold wooden accents and soft, plush rolled arms, this design helps you surf the great wave of relaxation. Sea Change: Can You Spot the Differences? The photos below look alike at first glance. They both feature a stylish blue sofa and loveseat in a living room setting. While they may seem similar, there are actually eight changes from the above to the bottom photo. Can you spot the differences? Comment in the comment section with the differences! Here’s a hint to get you started on one difference: it’s smart to check the art. One reason we love the Malibu is its soft, sheen material. This fabric is called chenille. Surprisingly, the low-nap chenille upholstery is also durable! Because of the tightly woven fabric, stains can’t weasel into chenille very easily. To get the longest life out of a chenille couch, ask your salesperson about our Guardian fabric protection plans. This stain repellent surrounds the fibers and repels water or stains to make your living room furniture last even longer. During our Blue-tiful Blowout this month, save $200 off original prices on two select sets. Click here for details on this May promotion. 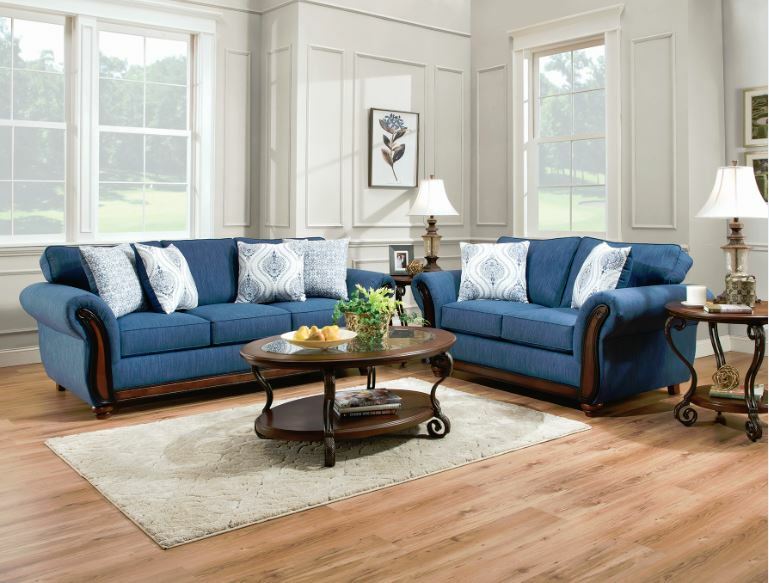 Originally $998, get this Malibu Sea living room set for just $798! Get the same deal on the Conversation Indigo set! Save $200 if you get either of these select blue sofa and loveseat deals before May 31, 2018. Are you in the market but don’t have the funds? We understand. Choose from 3 easy ways to take your furniture home today including payment plans and free layaway. Click here to learn more. Click here to find your local store. Did you love this blog post? Sign up here to get a weekly blog email with furniture buying tips, home trends, and savings ideas that you can actually use. I am trying to find this beautiful Malibu Blue Sofa & Loveseat and cannot find it anywhere. Our local store says that they don’t know when they’ll get it again. Please help. Hi, P. Crawford! Thank you for your comment. Unfortunately, we are unsure if/when we will bring back the Malibu Blue Sofa and Loveseat at this time. Hi I am Debi I am also looking for this furniture. Who is the manufacturer? I would like to know if this is ever going to be available again. I myself is looking for this furniture.. I had it on layaway and I went in one day and I was told they no longer had it.. I would love to find it somewhere so if anyone knows where I can get this furniture.. I would be very happy. Hi, Debi! Thank you for your comment.